"Sneaky wimps' way of punching. Highly illegal." 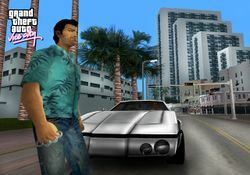 Tommy Vercetti with the Brass Knuckles in a pre-release screenshot for Grand Theft Auto: Vice City. 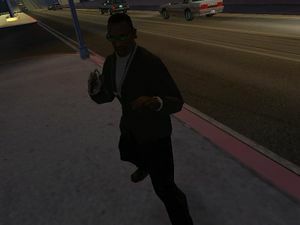 CJ with Brass Knuckles in Grand Theft Auto: San Andreas. Brass Knuckles are metal devices with holes punched through them, and are thus intended to be worn on the fingers while the fist is clenched. They are meant to increase the force of a punch, while minimizing the initial force needed to throw an arm, and when used properly, they create massive damage against an intended target. Brass Knuckles have been available in Grand Theft Auto: Vice City, Grand Theft Auto: San Andreas, Grand Theft Auto: Liberty City Stories and Grand Theft Auto: Vice City Stories. In each game, the force of a single Brass Knuckle punch is enough to knock a person to the floor. Ocean Beach, Vice Beach - In the alleyway behind the Ocean View Hotel, just north of the hotel. Worn by the bodyguards in the Malibu Club. Trenton, Portland - Spawns in an alleyway next to the Mean Street Taxis. Fort Staunton, Staunton Island - In an alleyway next to Charlie's Liquor Bar. Downtown, Vice City Mainland - In an alleyway across the south of the dirt track. Ocean Beach, Vice Beach - On the grassy area across the Ammu-Nation. This page was last modified on 17 May 2013, at 10:41.